Hey, everyone! Today I'm sharing my first outfit post for 2015. I wore this ensemble to the media launch of Islands Souvenirs' Cut and Style 2015 Campaign. 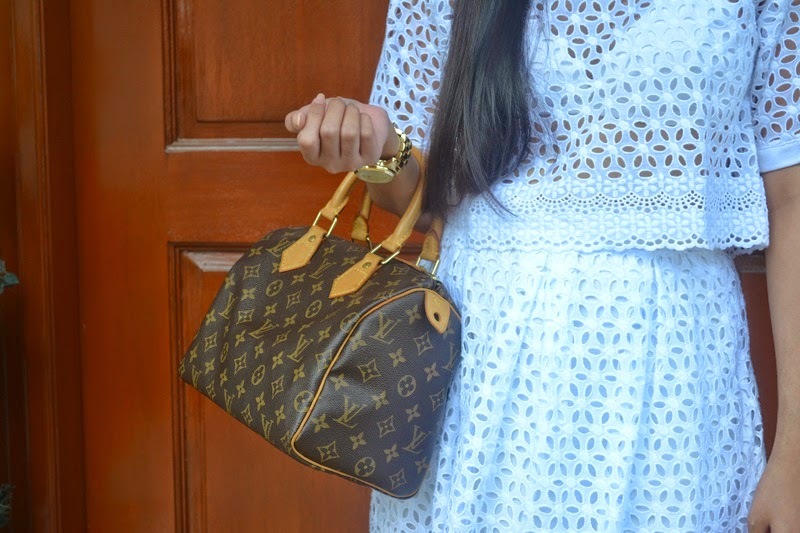 I went for a Spring-inspired look and teamed this eyelet co-ord with brown accessories. I purchased this cropped top and ladylike skirt combo early last year (see how I previously styled the skirt here) but only got to wear both pieces a few days ago. "Don't wear that, it's too matchy-matchy." I've heard people say this so many times but I feel there's an exception to this rule. While I don't really like wearing matching head-to-toe accessories, I personally think two-piece sets will always be trendy. Coordinates or "co-ords" are not only versatile items but they're practical to have in your wardrobe. If you don't feel like matching, you can always wear them separately. You not only get three outfits in one but you also get the opportunity to be creative and experimental with your everyday sartorial choices. So how do you work this trend? It's super easy! You can either play it safe by pairing solid-colored co-ords with minimal accessories or make a loud statement by wearing a matching printed top and bottom with bold accessories. If you prefer the latter, you can always don a neutral blazer or coat to tone down your look. The best thing about this trend is that it requires very little effort. You don't need to rack your brain in coming up with a fashionable look. It's perfect on days when you don't know what to wear or when you don't have enough time to put together an outfit.